Information about performance dates and times will be posted to the current performance page as and when it is available. Usually, tickets for performances are purchased via the venue or on the door. For ALL outdoor events we strongly recommend that you bring something to sit on – such as a low back chair or a blanket, and wear warm, waterproof clothing! 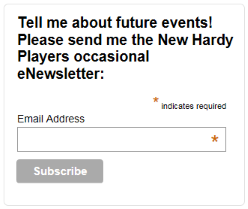 The New Hardy Players and owner of the venue reserve the right to refuse entry. Outdoor venues are subject to weather conditions and The New hardy Players reserve the right to stop or cancel any performance. Refunds are given at the discretion of the New Hardy Players and strictly limited to the price paid for the ticket.